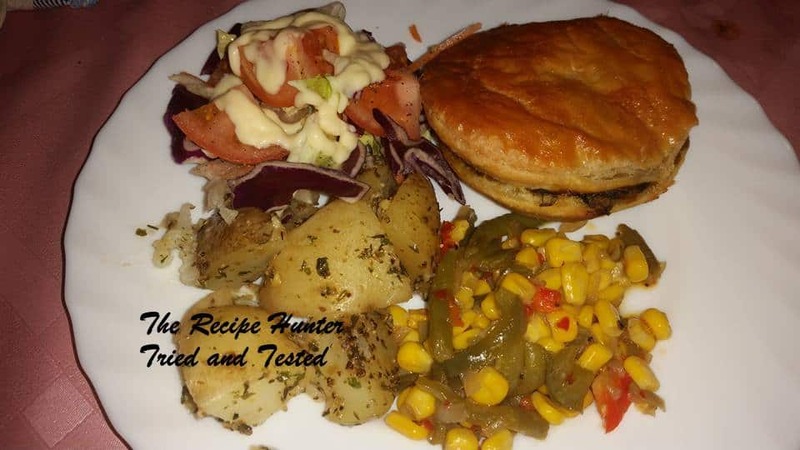 Chicken and spinach pie, mixed green salad, herby garlic potatoes and corn and green beans tossed with onion and peppers. Fry chopped onions till golden brown. Add cubed chicken, 1 tsp salt, pepper and 1tsp garlic and chillies if preferred. Cook through and add chopped spinach, cook until wilted and add 250ml cream and 1tbls maizena. Cook until it thickens and leave to cool before filling into the pastry shells. Cover with pastry, brush with egg and bake till golden brown. I didn’t have cream, so added 2 tsp bisto gravy granules mixed with 1/2 cup water.